Terry Gunn is co-owner and founder of Lees Ferry Anglers Fly Shop and Guide Service and Cliff Dwellers Lodge in Marble Canyon, AZ. Terry has been a full-time fishing guide since 1983 and is an internationally recognized fly fishing expert, author, photographer, and speaker. Terry has fished around the world in both fresh and saltwater. In 1986, he co-founded Crystal Creek Lodge, considered by many to be one of Alaska’s finest fly-out fishing lodges. Terry Gunn lives and guides on one of the most beautiful tailwaters in the world at Lee's Ferry on the Colorado River. Tailwaters provide exceptional fishing and knowing how to fish them can make or break your day. Listen in and learn Terry's secrets to getting the most out of your day on a tailwater. He also started Baja Anglers, a fly fishing charter boat operation and retail store in Cabo San Lucas, Mexico. 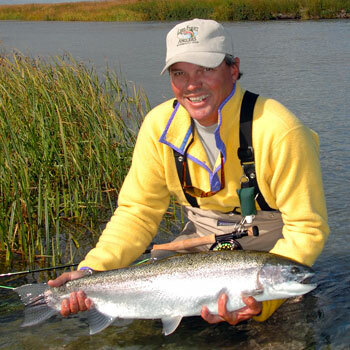 He is a consultant to several leading manufactures of fly fishing equipment and fishing lodges. He has held or holds 10 IGFA world records, all on fly rod, both fresh and saltwater. Terry’s wildlife and fly fishing photographs have appeared in most all of the outdoor magazines as well as books, journals, newspapers, calendars and brochures. He is a recognized author and has published many technical as well as destination fly fishing articles for several magazines. He and his wife Wendy Gunn have recently compiled and published the book The 50 Best Tailwaters to Fly Fish. Terry and his wife Wendy are the co-hosts of Fly Fish Television Magazine, an educational fly fishing show that has aired on Fox Sports National and International, the Outdoor Channel. They also have two videos, an Introduction to Fly Fishing and an Introduction to Fly Casting. Terry was the photography host for the television series, America’s Outdoor Journal. In addition, he has appeared on scores of other fly fishing shows including In Search of Fly Waters, Fly Fishing the World, Fly Fishing America and Fly Fishing Video Magazine. Terry and his wife Wendy competed in the first ESPN Great Outdoor Games in Lake Placid, NY. Terry Gunn lives in Marble Canyon with Wendy and son Troy.